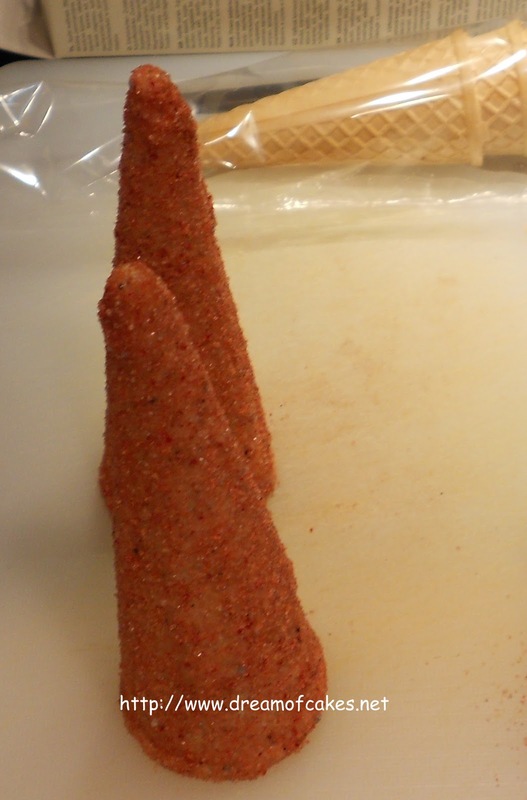 I used these Ice Cream Cones for making Castle Towers. The technique is very easy and simple. 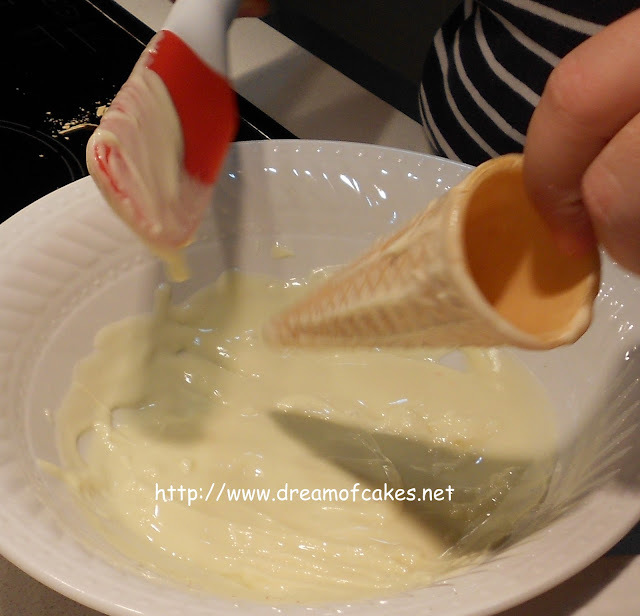 I used only 4 ingredients which where the ice cream cones, caster sugar, food coloring and white sugar. These Castle Towers where used for a Princess Castle I made two days ago, for two lovely sisters, Marissa and Corina who had a birthday party on the 22nd of October. I will post the Castle Cake in a future post. In a plate, mix together the white sugar and the food coloring. Stir until the color is well blended into the sugar and then set aside. Stir a bit, until the chocolate temperature is reduced to 30º degrees (not hot any more). 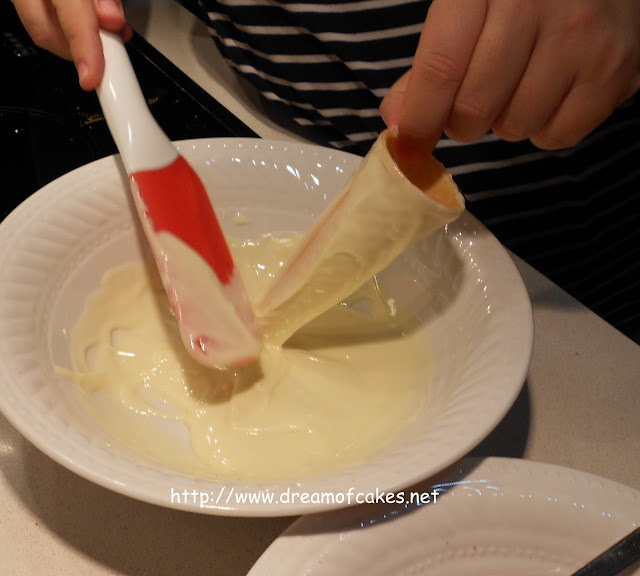 Then take a cone and place it into the white chocolate, making sure that it is covered with chocolate. Use your spatula to take off the excess chocolate. 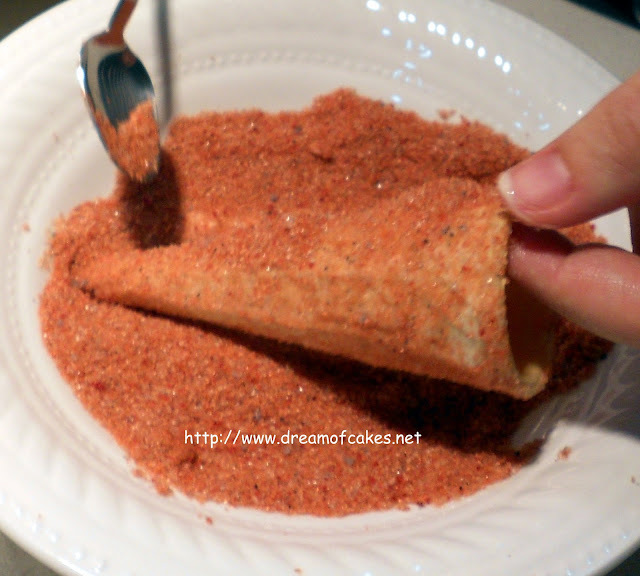 Place the chocolate covered cone into the sugar and, with the help of a teaspoon, cover the cone with the sugar. Put them in the fridge for 5’ minutes. Your sugar painted cones are ready to be used!!! 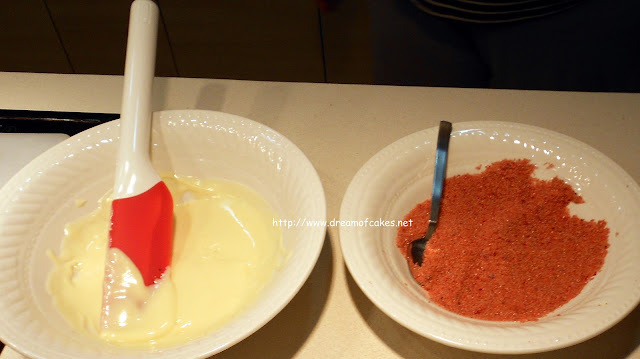 - In a plate, mix together the white sugar and the food coloring. Stir until the color is well blended into the sugar and then set aside. - In another plate melt your white chocolate. I cut the chocolate into small pieces and I put it in the microwave for 30 seconds. ( I used high heat) Stir a bit until the chocolate temperature is reduced to 30º degrees (it is not hot any more). - Then take a cone and place it into the white chocolate, making sure that it is covered with chocolate. Use your spatula to take off the excess chocolate. 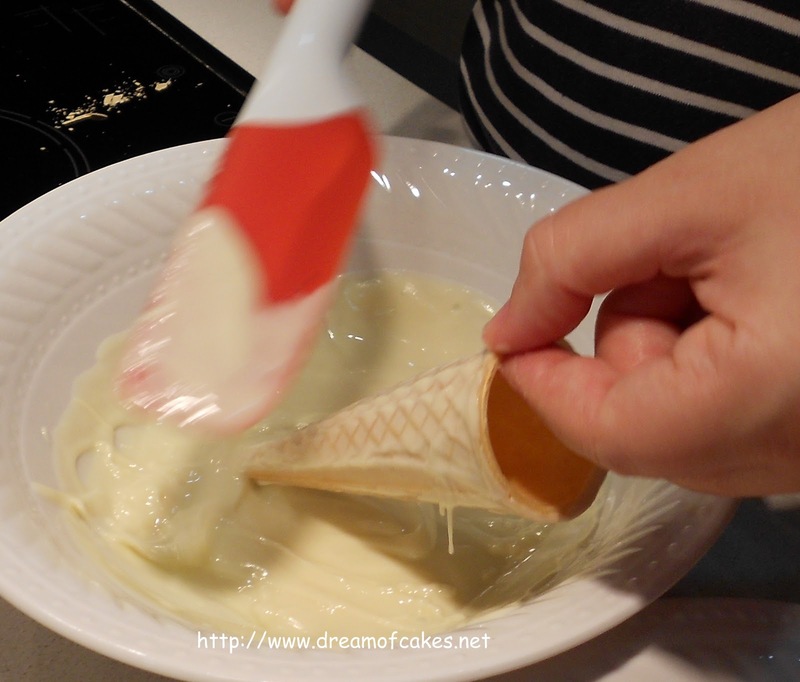 - Place the chocolate covered cone into the sugar and, with the help of a teaspoon, cover the cone with the sugar. - Place them in the fridge for 5’ minutes. Your sugar painted cones are ready to be used!!! I just love sparkles... its as simple as that. It's actually quite easy :) Great! So cool! Now I need an excuse to make one because its just too naughty for me to make without a party :) Buzzed! 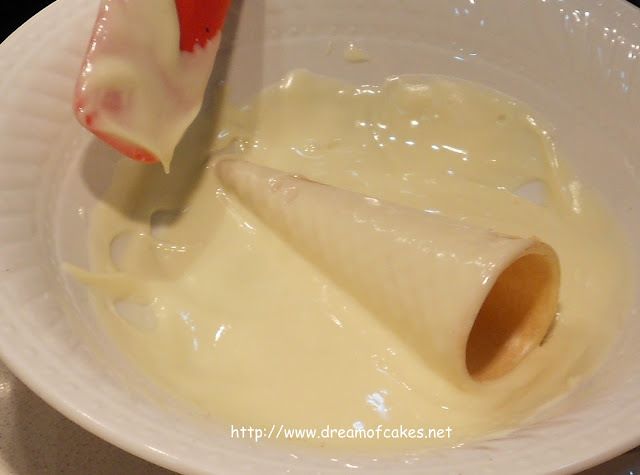 The white chocolate - hmmm - these cones look right for Christmas or a party! This is such a great technique you have shared. Those cones could come in handy! I am thinking with green they could become Christmas trees, on top of a round of frozen ice cream they could become hats and the list goes on...Great post! Thanks for sharing, looks good for cake decoration. Have a nice day. Thanks for sharing this technique with us! Pretty and darn tasty, too! I love how easy these are to make and I can see them being used for a variety of things! Those are SO pretty! Your attention to detail is incredible! Cones are a really good idea right , I can't wait to see the cake :D .
That is a wonderful idea! 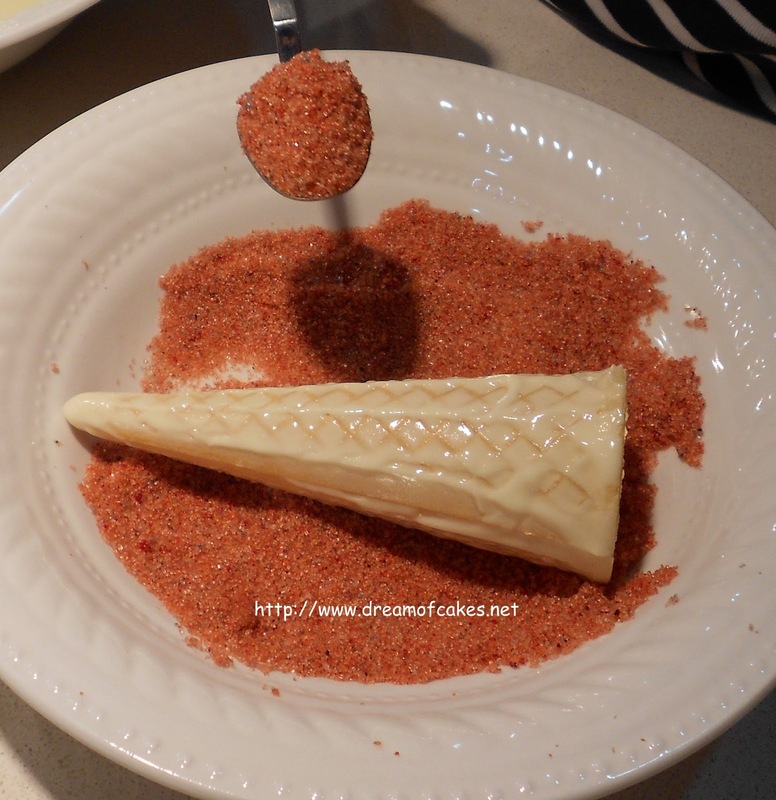 I think I can also use candy sprinkles or other crumbs depending on the theme...I am so looking forward to seeing the castle cake. Such a great step-by-step tutorial, thanks for posting this! All your designs are so gorgeous, I bet they taste even better than they look! I love this idea! They are adorable! Oh you are just so clever!!! I never would have thought of doing something like that! Well done ! You created a really great-looking cone--I'm for anything involving white chocolate!